Probably everyone in England has there own favourites whether it is David Tennant, Matt Smith or even Tom Baker but for Capricorn Research who was 8 years old himself at the time there can only really be one Doctor. In 1963, William Hartnell appeared from nowhere to show a whole generation a vast and incomprehensible Universe. Fortunately it was populated with enough eminently defeatable aliens to draw us all along in our dreams that we could be time lords ourselves. They always say that boys never really grow up and Capricorn Research is a good example, given that he still believes that this is his real career over 50 years later. Most people would dismiss this as the ramblings of a barely sane old goat, but the evidence for it is strong as his Moon at 16.30 Capricorn is exactly conjunct the Sun of the real Doctor Who. 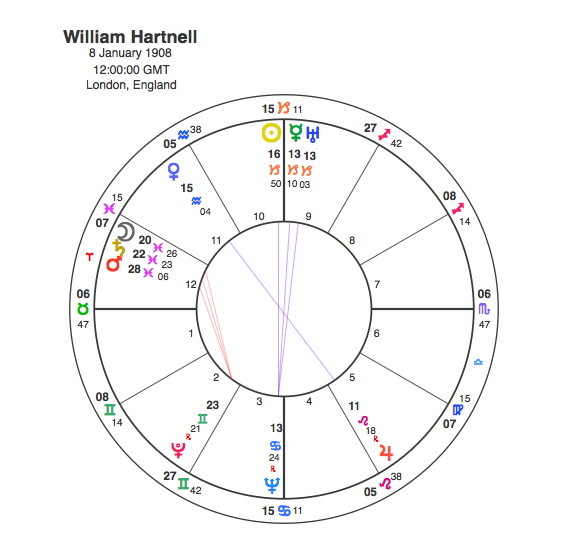 As many of these articles have shown, the chart of an actor who is known specifically for one role will also symbolically describe that part, and as William Hartnell was the first Doctor Who, this chart is that of the Time Lord himself. Of course it is with the Sun with an absolutely exact Mercury / Uranus conjunction what could be better ? The character of the Doctor was initially shrouded in mystery. All that was known about him in the programme’s early days was that he was an irascible and slightly sinister ( Sun in Capricorn ) but eccentric ( conjunct Uranus ) alien traveller of great intelligence ( and Mercury ) who battled injustice ( again Uranus ), while exploring time and space in an unreliable time machine, the “TARDIS”. The only conceivable symbol that could treat the space / time continuum in such a fluid manner would be Pisces and its ruler Neptune. Its totally fitting that Hartnell / Doctor Who has the Sun opposite Neptune and a Moon / Mars / Saturn conjunction in Pisces. It’s also beautifully apt that this transcendent and fluid view of the Universe ( Moon in Pisces ) gets him into a lot of difficulties ( conjunct Saturn ) and battles ( and Mars ). The other thing we know about the Doctor is that he doesn’t have a love life, but is always accompanied by a young attractive female who is just a friend and companion. Any chances of said relationship developing further are always scuppered by the requirements of time travel and saving the Universe. Venus in Aquarius opposite Jupiter anyone ? So when would this transcendent being be transmitted into our living rooms to force so many to hide behind their sofas ? It was by Earth time 17.16.20 on 23rd November 1963. The time traveller symbol is in your face with 4 planets in Sagittarius and the Sun in trine to Jupiter. Again the Moon is conjunct Saturn in the eccentric sign of Aquarius but the all round synastry with the Hartnell’s chart is extraordinary. As Neptune is so prominent natally you would expect it to be around and it is in exact sextile to Hartnell’s Sun. Pluto is trine his Uranus and Mercury. The Moon in the show’s chart is exactly trine to the minute of Hartnell’s Pluto. Venus and Mars are square to his Moon / Saturn and perhaps most significantly of all Jupiter has returned to his natal position of 10 degrees Aries. The real Doctor Who indeed. The question now is how will Peter Capaldi work out as the new Doctor. Are we looking at a kind of cosmic Malcolm Tucker or will he show a gentler more mysterious side ? Well it could be both actually. Capaldi is an Aries so his version of the Doctor is going to be different from Hartnell’s. As we can see from the chart of the show, the Sun and Jupiter in aspect together shows the traveller. Capaldi has the Sun opposite Jupiter which suggests even longer journeys. The Sun is also opposite Neptune so we have the traveller through space and time. Mars is in Aquarius opposite Pluto which with the Sun in Aries opposite Jupiter seems to indicate that we are in for another Tucker, a sharp and vicious Spin Doctor if you like. The Moon in Pisces trine Neptune suggest not and shows that he might play it similar to Hartnell who had the same combination. Matt Smith also had the Moon in this sign. David Tennant and Patrick Troughton both share Capaldi’s Sun / Venus combination of Aries / Pisces. All 3 also have the Moon is aspect to their Venus. Mars in Aquarius works too as it did for Christopher Ecclestone and Tom Baker. Doctor Who is essentially a man of action so Sun / Mars aspects come in handy. Ecclestone, Tenannt, Smith, Sylvester McCoy and Paul McGann have all had either the conjunction or the square. Capaldi has the sextile. Capaldi would be practical too with the Sun trine Saturn. Hartnell, Peter Davison, Colin Baker, Ecclestone, McCoy and Smith all have Sun / Saturn aspects. The Moon obviously would have to have contact with extra terrestrials and Capaldi has the trine with Neptune exact with an orb of only 1 minute. Hartnell, Troughton, Pertwee, McGann and Tennant share Moon / Neptune aspects. 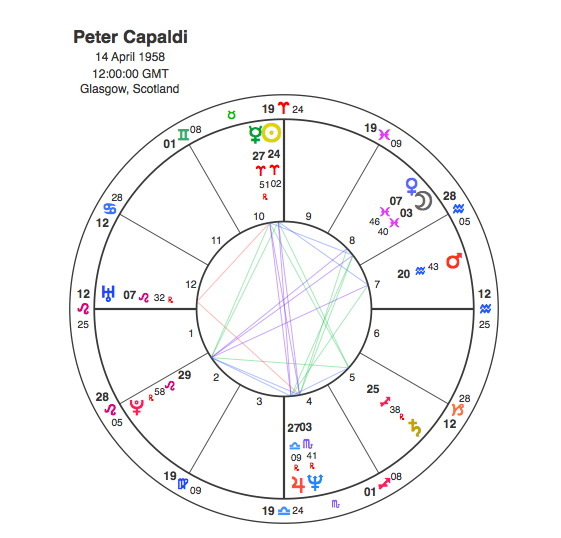 But for a figure that reincarnates itself every three years, Capaldi’s Moon / Pluto opposition puts him well in line with his heritage as no fewer than 7 of the previous 11 doctors have had Moon / Pluto aspects which works out at about twice the expected figure. An equal tie with Moon / Pluto on 7 as most common aspect for the Doctor is that between Mars and Saturn. If you think about the troubles that he encounters weekly its not surprising. Capaldi makes it 8 but at least he has them in easy sextile. The new man shares Venus / Pluto , Venus / Jupiter and Mars / Pluto aspects with 5 other Doctors. But if you really want to know which Doctor Capaldi will be most like, think David Tennant. Not only are they both Ariens, but they have Venus in Pisces in aspect to the Moon, Jupiter, Neptune and Pluto. They also have a Mars / Saturn and Pluto connection. As Tennant was the most popular Doctor since Capricorn Research’s generation, the new man is obviously onto a winner. But the most amazing thing about Peter Capaldi’s chart which shows he was born to be The Doctor is the aspect pattern. If you look at his chart the Sun, Mercury, Mars, Jupiter, Neptune and Pluto are all linked by an extraordinary symbol. Its made up of oppositions, sextiles and trines but its not a Grand Trine or a Grand Cross. Capricorn Research has come across this pattern before but is not aware that there is a name for it. If you look at the shape of it, you can clearly see a rectangular box, so from now on this aspect will be known as ” The Tardis “.